It’s hard to put down in words just what Johnny Hallyday meant to France. On the one hand, he was seen as a slightly embarrassing rock-and-roll dinosaur that just kept going no matter how many times one huffed with indignation at his continued presence. On the other hand, he was simply a fun-loving singer who adored what he did and who was adored by millions; a constant presence in the background reminding everyone that they all love a bit of Johnny every now and then. My first impression of Johnny Hallyday was when I was a student in France back in 1988. To me, he was a bizarre relic of the 1960s; the embodiment of some kind of highly kitsch French twist on an American phenomenon. In the same way that Irish country-and-western singers have created a mid-Atlantic hybrid persona with its own particular style and accent, so too had the French seemingly created this kind of “French Elvis” who sang in French with the occasional trademark Americanised vowel sounds (just listen to the way he sings the word ‘amour’ in the video below if you’re not sure what I mean). Gradually, and from repeated exposure, we (I mean the other Irish students and I) grew to grow fond of Johnny in the same cringey kind of way that you might be fond of a ridiculous old uncle who would always be the first to get drunk and sing strangely at a family gathering. 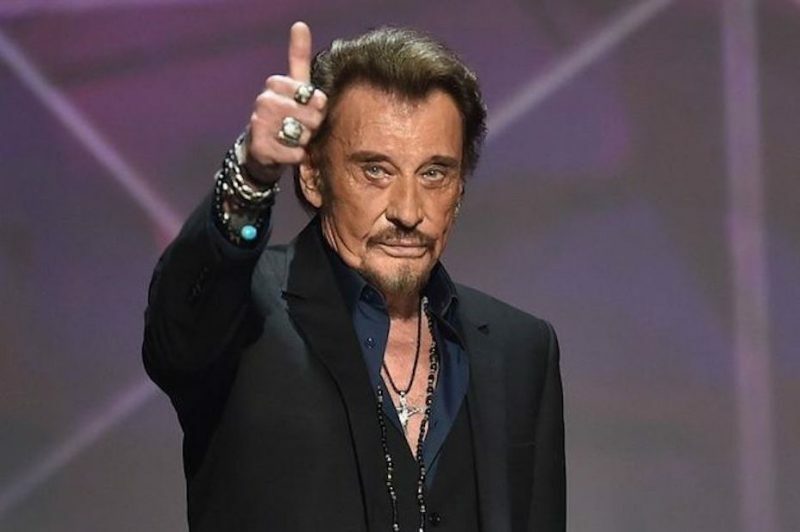 Johnny was born Jean-Philippe Smet in 1943. His original surname he got from his Belgian father but his stage surname was borrowed from his aunt’s American husband Lee Hallyday – a professional dancer who became a close confidant during Johnny’s formative years. He rose to popularity quite quickly during the 1960s. This was the period known in French popular culture as the ‘yé-yé’ years – a time when rock-and-roll songs translated into French became popular with artists such as Hallyday, Claude François and Françoise Hardy. Hallyday, however, was more interested in the meatier rock side of the tracks rather than the bubblegum pop associated with les années yé-yé and he pursued a career that involved collaborations with some of the more serious rock stars of the age, such as Mick Jones, Jimmy Page and Peter Frampton. The result was a career of astounding longevity and one that saw him sell some 110 million records worldwide – a salutory lesson for those who seem to believe that you have to record in English to enjoy worldwide success. He was so ridiculously famous in France amongst people of all generations that he loved living in California for much of the latter decades of his life, where he could roam around in relative obscurity on his trademark Harley Davidson.